What Are Autism Programs For Teens? Are you concerned that your teenage son will never live up to his full potential at school, work, or home? Do unhealthy habits like gaming keep him from pursuing hobbies or meeting new friends? Does helping your teenager cope with emotional or academic struggles drain energy from every other area of your life? Autism programs for teens might be the answer you’re looking for to help your teen. Many young men with autism simply don’t receive the support they need in a traditional educational or therapeutic setting. Everyday experiences tell them that they are not intelligent, obedient, or dedicated enough to succeed in life. Sadly, this attitude leaves many promising young men feeling like “failures” or “mistakes” because of circumstances outside their control. Successful autism programs for teens begin with the expectation that every person can thrive given the proper resources and guidance. 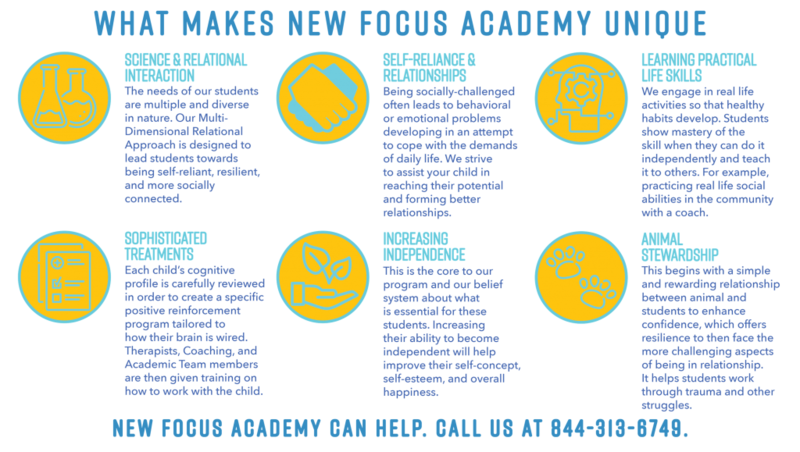 By reinforcing healthy social behaviors, spotlighting each student’s unique strengths, and offering a diverse array of educational opportunities, New Focus Academy creates an environment that works for your child—not the other way around. Build Independence: Our highest goal is to help boys with autism grow into self-assured, self-reliant young men who can maintain healthy habits and take pride in their own success. Experience Life Broadly: Some autism programs focus solely on social skills. Although it’s important for young men to understand appropriate cues and responses, social engagement is built around confidence in all areas of life. Find A Network: Through family education and peer support, our team creates a culture of support that follows each student long after they leave our residential facility. New Focus Academy students graduate with a toolbox full of coping strategies, practical life skills, and aftercare resources to help them build a happier, healthier life. Who Do Autism Programs for Teens Help? All of these challenges can prevent young men from living their fullest, happiest lives. Some of them may simply struggle to turn in homework on time, finish their chores, or get along with their peers in school. Many withdraw from challenging social situations and seek comfort in video games or online activities. Some others show aggression toward others or display the tendency to harm themselves. Many young men are told, time and time again, that they will never succeed or excel because of the issues described above. This is simply not true. Through evidence-based therapies, dedicated mentoring, and healthy peer-to-peer support, our students learn to not only cope with the demands of everyday life, but also share their talents with the world! While we do our best to encourage and support every teen who enters our program, some young men struggle with challenges beyond our treatment capabilities. 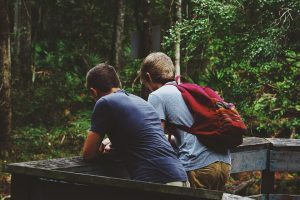 If your teenage son engages in a pattern of sexually predatory or repeatedly violent behavior, we are more than willing to refer you to programs more equipped to serve your needs. How does New Focus Academy help teens on the autism spectrum? At New Focus Academy, our ultimate goal is helping young men develop autonomy and independence. We aim for each graduate to reach his highest goals, conquer his scariest challenges, and pursue his fullest life. Our autism programs are simple, yet highly flexible and individualized. When a student enters our autism program, we complete a thorough and comprehensive intake assessment that identifies their unique struggles and strengths. Through additional interviews and observational sessions, we select several significant issues to tackle during their time in our program. Drawing on the latest therapeutic research, our experienced team of clinicians creates a custom treatment plan to build autonomy, confidence, and resilience. 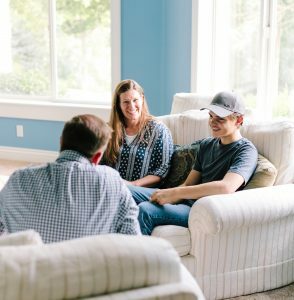 Although the most successful and foundational elements of our autism program remain consistent, no two treatment plans are the same—just like no two teenage boys are the same! We constantly adjust our approach based on observation and feedback. Academic Success: The first step toward a diploma is developing a passion for learning and a willingness to tackle challenging problems. We use engaging, hands-on settings to teach traditional subjects—including math, language arts, and social studies—as well as practical skills like balancing a budget, managing schedules, and collaborating with a team. Community Engagement: Bonding with your peers is easier when they understand what you’ve been through. We cultivate a respectful, nurturing environment where every young man can share his feelings and interests without judgement. By interacting successfully with their peers, our students develop social skills that will stick with them long after they leave our care. Fun Activities: Leisure and recreation activities are enjoyable—yet powerful–ways to change your perspective on life. Through team sports and outdoor adventures, our students explore the world and expand their abilities. Each time a student masters a new life skill, overcomes an emotional barrier, or works through an academic struggle, they gain the self-respect and self-confidence to try again. Upon entering New Focus Academy, every teen is matched with a dedicated coach. Coaches meet with students weekly to review progress, discuss challenges, and set new objectives. Totally invested in and focused on student success, our coaches form the backbone of our autism program. This unique mentoring program gives students a safety net in every situation. Struggling to maintain a healthy self-image? A coach offers an empathetic ear and consistent, positive reinforcement. Confused about a school assignment or frustrated after a difficult therapy session? A coach can immediately provide words of encouragement, adjust the treatment program, or correct inappropriate behavior. Motivational Interviewing: This supportive, one-on-one therapeutic method builds trust between students and their therapists while equipping them to tackle complex problems together. Resilience Therapy: With a little determination and courage, it’s possible to overcome most obstacles. This therapeutic approach helps students cope with the trauma, stress, anxiety that keep them from thriving. Social-Emotional Fluency: Through this structured treatment methodology, students learn the basics of emotional intelligence and social interaction. This program is designed to hone life skills like conflict resolution, interpersonal communication, and community engagement. Students also attend daily “skill groups” that use music, reflection, discussion, and goal-setting to foster camaraderie and implement skills they learn in our autism programs. If you’ve spent any length of time with young men, you know they are equal parts goofy and adventurous! New Focus Academy directs teenage energy into wholesome recreational activities like rock climbing, hiking, and cycling. Parents of teenagers with developmental delays often focus exclusively on social and behavioral skills, not realizing that competency in other areas will help their child thrive. As teenagers move into adulthood, they should develop a well-rounded range of life skills. Young men with developmental delays may find this process difficult, but it’s certainly not impossible. Maintain good personal hygiene habits? Safely navigate around their city and home? Manage a budget and make responsible decisions about money? Identify hobbies and meet like-minded friends? Analyze a problem and develop a solution? Regulate strong emotions like anger, fear, and passion? Acknowledge mistakes, accept critique, and apologize for hurtful behavior? Every one of these skills is essential to a healthy, balanced adult life. Studies have shown that young men who feel confident and successful in every area of their lives, not just in social situations, are more prepared to tackle the challenges of adulthood. Current research suggests that positive reinforcement is one of the most powerful, effective methods for building life skills. Acknowledging a teen’s hard work with genuine, thoughtful praise goes further than a thousand corrections. New Focus Academy uses these principles of positive reinforcement and life skills growth—along with proven therapies and a supportive mentoring environment—to mold young men into their most confident, resilient selves. To speak with our treatment team or learn more about our innovative autism programs, please call 844-313-6749 or visit https://newfocusacademy.com/principles/.